ENCINITAS — Five years ago Avery Ellisman planned to go fly fishing after dropping his oldest daughter, Shira, off at the Montana Fiddle Camp located in the state’s historic Little Belt silver mining valley. Instead of fish, Ellisman was the one to get hooked —on the music camp. “Once there, I had to rethink my plans to fly fish while my daughter participated in fiddle classes as the nearby river was running too fast and high, and my angling skills were not up to the near-impossible challenge,” he recalled. To pass the time, Ellisman signed up for an advanced class taught by Canadian fiddle maestro Calvin Vollrath. “I was overwhelmed not only by how much I learned, and how fun it was, but I was powerfully moved by seeing young people and older people joyfully engaged in a joint activity where their ages became irrelevant,” he recalled. 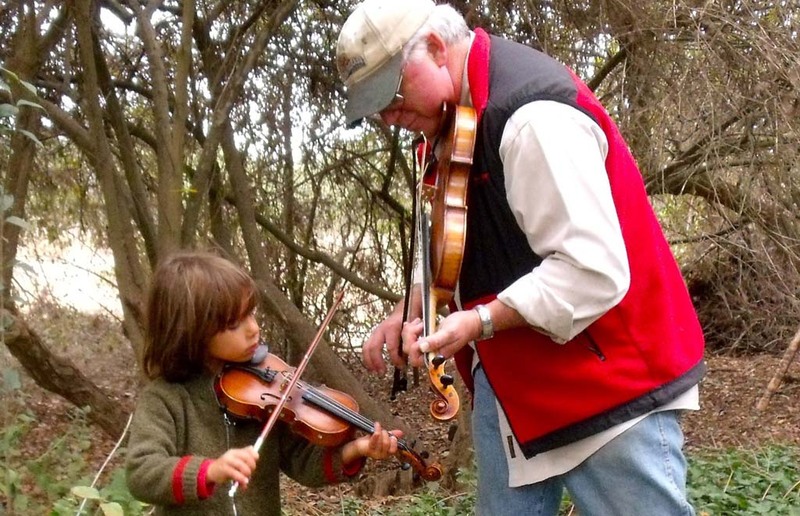 Ellisman committed himself to researching similar camps with the goal of opening a family fiddle camp in Julian in 2011. His decision was influenced by his love of the gold mining town and its reputation for hosting acoustic music events. Vollrath was recruited to perform at the first two camps. This year instead, Ellisman asked Vollrath to travel to Encinitas to reach a new, broader audience. Vollrath’s performance is scheduled for 7 p.m. Oct. 23 at the historic Olivenhain Meeting Hall. He says music lovers can expect to hear traditional fiddling influenced by Scottish immigrants to Canada and the United States as well as Texas and Appalachia style fiddling. He’ll also play original tunes from the nearly 60 albums he’s recorded and demonstrate how adaptable fiddling can be to any genre. Also playing will be local guitar legend Phil Boroff, performing with his son, David, on violin, and Grammy-award winning bassist, Gene Libbea. The Olivenhain Meeting Hall has a history as a popular music venue that can be traced to the end of the 19th century when construction was completed. The interior included a musician’s stage that was used for live music for dances that continued through World War II. Ellisman expects a big turnout for the concert since they are so many followers of acoustic string music along the coast from Del Mar and Rancho Santa Fe to Oceanside. Encinitas is one stop on a five-city tour that will also take Vollrath to Ventura and Red Bluff, Calif. and Vancouver and Spokane, Wash. The event will include VIP concert seating and a pre-concert reception for Vollrath and the other performers with refreshments that include Mom’s Julian apple pie for a price of $50. General admission, which is limited, is $20. Few, if any, tickets are expected to be sold at the door. Advanced tickets can be purchased on-line at artful.ly/store/events/1613. Proceeds will be divided between funding the production of the 2014 Julian Family Fiddle Camp and its annual scholarship fund. Ellisman said that those wishing to make significant donations are encouraged to do so via the Julian Family Fiddle Camp’s nonprofit fiscal sponsor, Fractured Atlas. Details can be found at fracturedatlas.org. For additional information, contact Avery Ellisman at (760) 522-8458 or avery@familyfiddlecamp.com. For information about the Julian Family Fiddle Camp, visit familyfiddlecamp.com.